Welcome to the Old Courthouse Museum. This building was constructed in 1873-74 for $7000, and, with the exception of the five-year period from 1882 to 1886, it served as the Pepin County Courthouse until 1985. It is the only remaining wood-framed courthouse in Wisconsin and one of only two Greek Revival style courthouses in the state. Both the courthouse and jail are listed on the State and National Registers of Historic Places. Now more than 140 years old, the courthouse was originally built without electricity and plumbing. Many functional and cosmetic improvements have been made to the building over years, but several areas of the courthouse are still close to original, including the awe-inspiring upstairs courtroom. One of the world’s 100 most important educators, Helen Parkhurst’s devotion to children began at an early age in Pepin County, including her first teaching job at age 17. Parkhurst studied under Maria Montessori, developed her own educational theory called the Dalton Plan, opened her own school in New York City, wrote several books and had her own radio and television programs. Her influence spread across the globe, with schools in the Netherlands, England, Japan and others adopting the Dalton Plan of education. 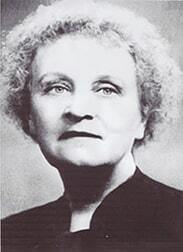 The new Helen Parkhurst exhibit traces the life of this extraordinary woman from Durand! Click here to learn more about the infamous Maxwell Brothers!